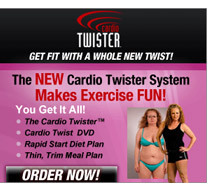 Summary: The Cardio twister is a great way to work your whole body using only one machine. The Cardio twister is a great way to work your whole body using only one machine. The bi-directional step motion and the upper body support works your arms, back, shoulders , abs and obliques. 20 different core muscles are getting a great workout on the Cardio Twister. Everything you need to get your body in motion and on your way to looking great.